Hamas leader claims terror organization 'sword and shield' of 'Palestinian nation,' promises to attack Tel Aviv in next war. Hamas leader Yahya Sinwar warned Israel that "if the Strip is dragged into war, Israel will suffer. It won't evacuate just the towns bordering Gaza, but also Ashdod, Ashkelon, and even Tel Aviv." "Our fingers are still on the trigger, and they'll stay there in order to protect the Palestinian nation. Hamas will be a sword and shield for the Palestinian people." On Wednesday, the Palestinian Authority's Al-Quds newspaper reported that the various local factions - headed by Hamas and Islamic Jihad - ordered their members to cease using explosives along Gaza's border with Israel. The report also claimed that the nightly demonstrations, as well as sending explosive and incendiary balloons into Israel. 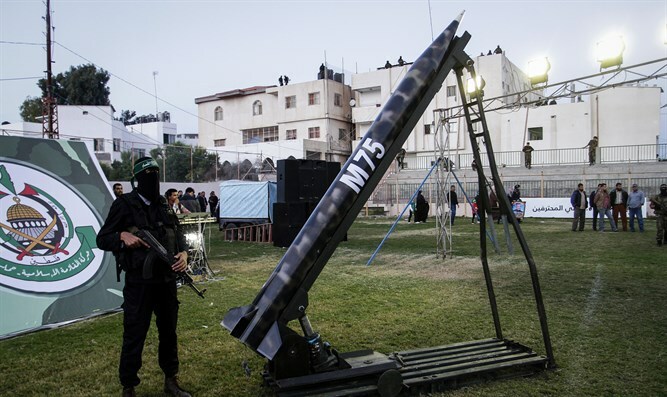 Egypt is currently working to broker an agreement between Israel and Hamas which will end both rocket attacks and the launching of explosive and incendiary balloons, as well as the the violent riots held weekly along the Gaza-Israel border. Israel, in return, has eased restrictions on the fishing area and will gradually open the Gaza crossings to allow additional goods through. Later, Israel will agree to allow the Qatari money into Gaza. The funds are intended to improve Gaza's water, sewage, and electricity infrastructure.